Sand River Cohousing is a community of 28 homes owned by people aged fifty-five or over who aspire to an actively green and sustainable lifestyle. We are a self-governing and self-managing community—not an assisted living or extended care facility. Residents participate in the activities and life of our “extended family,” and contribute by joining work teams and/or committees. ​We have a limit on the number of units that may be rented at any one time. The reason is twofold—to enable lenders to offer mortgages with confidence and to maintain the spirit of community. In line with this, please note that we discourage part-time occupancy. We want prospective buyers to be sure they are ready for a cohousing lifestyle. So we warmly invite you to stay for a couple of nights in our comfortable guest room, take a tour with one of us, share a community meal, and even attend a community business meeting. Let us know when you are ready to visit and we will agree on a day and time to get together. All the best to you from Sand River Cohousing. Leave the hustle and bustle for the privacy and serenity of your new 2-bedroom 2-bath home in Sand River, a 55+ cohousing community. Sand River Cohousing, ​developed in 2009, consists of 28 duplex residences with environmentally sustainable features, along with a common house and footpaths. Your future home features many upgrades as well as a private setting with views of the arroyo. See full description here and contact Daisy at daisyinsantafe@gmail.com with your questions and interest. Is living and working with a small group of people creating community in the high desert right for you? 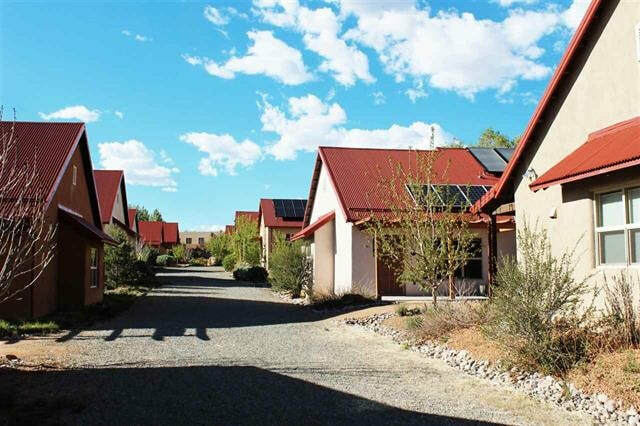 Listed at $238,000, this one-bedroom home in a 28-unit, vibrant intentional community for folks 55 and older boasts many upgrades: solar electric, study with built-ins, and hardscaping with a pumice wick for the ultimate in water conservation. Amenities include a common house with guest room, three electric-car charging stations, as well as nearby walking trails, bus stop, and shopping. Email owner Pam Gilchrist with your interest at pamgilchrist1@gmail.com. If life in a participatory, green community feels right for you, consider this 2-bedroom, energy-efficient, passive-solar home with tiled floors and radiant heat. The south exposure affords a light-filled home environment. Upgrades include a tiled shower, security screen door on the back entry, and washer and dryer. A common house, walking paths, and native landscaping contribute to the communal features of Sand River. Stores, hiking trails, and a city bus line are conveniently located nearby. Listed at $260,000. For more information, contact Barbara at Starhun123@aol.com. For more information about living in our community, please contact us.